The Conservation Innovation Grant (CIG)Cedar Basin received in 2013, Building Resiliency to Climate Change: Improving Soil Carbon and Nitrogen Management Through the Use of Soil Health Testing and the Adapt-N Management Tool, is winding up by the end of September, although we won't be able to collect and analyze the final data until after this season's harvest is in. With that project finishing, we are pleased to announce that Cedar Basin will begin another CIG October 1st. The new CIG is entitled, Enhancing the Soil Survey for the Benefit of Farmers and the NRCS: Using Innovative Technology to Map and Share Detailed Soil Profiles for Precision Agriculture and Water Quality Management. The grant provides the opportunity to use an innovative technology, the Trimble Soil Information System (see Trimble Soil Information System), to much more accurately, and in much more detail, map Iowa's soils. With the current Iowa Soil Survey 30-40 years old and the product of outdated technology and human error, it is essential that it be updated to make it possible to practice true precision farming and improve water quality management practices in today's high-tech world. sector to share the cost and work of bringing the Survey up to date. NRCS CIG funds through EQIP will match farmers' contribution to mapping soils dollar for dollar. The project has an important cover crop/pollinator habitat component. 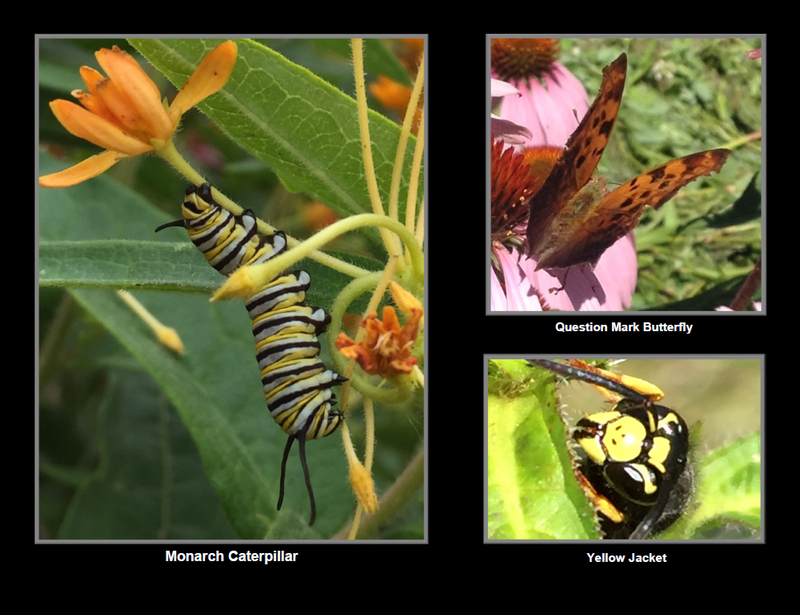 With the guidance of Dr. Matt O'Neal, ISU Department of Entomology, we will look at the under-recognized role pollinators may play in Iowa row crops. Trimble SIS will be helpful in identifying marginal lands that might best be used for growing alternative crops and/or pollinator habitat. Anyone farming within Cedar Basin's service area (mapped here: About Us) can take a look at the farmer information packet on Conservation Innovation Grant, and contact us if you're interested in participating in the project. The grant is for 2,000 acres, 500 of which are already spoken for. We're really excited about this project and the potential it has to significantly improve precision farming capabilities and water quality management. We'd like to thank our project partners, who, in addition to NRCS, include Iowa State University, USDA ARS Laboratory for Agriculture and the Environment, Trimble, and journalist Lynn Betts, for their support of this project. Robin spent the better part of this summer completely enthralled by these little life sustainers. The diversity of species just on Cedar Basin's acre and a half is, in the old sense of the word, awesome. Every time she turned around, there was a species she'd never seen before--although, not all of them were beneficial. There are a lot of pretty pollinators out there that are not what a farmer wants to see. 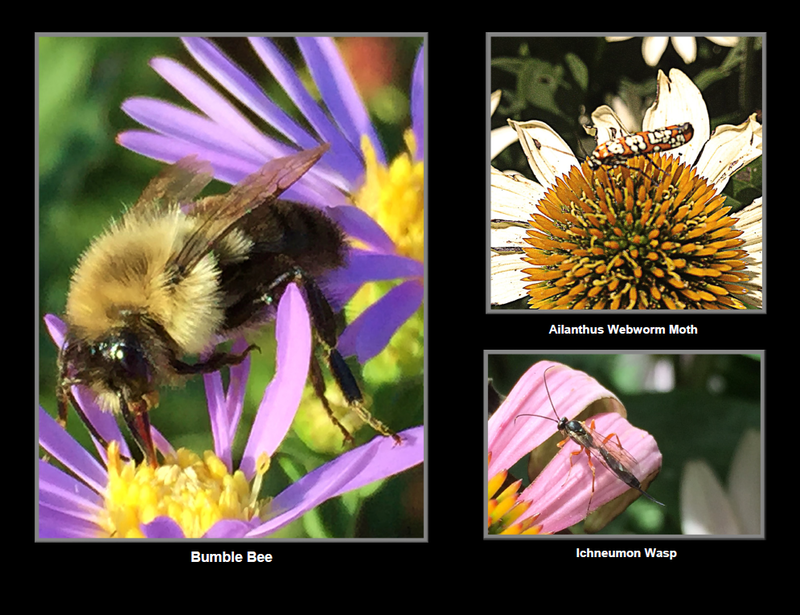 She took countless photos of everything from monarch butterflies to yellow jackets to bumble flower beetles. Robin developed a calendar, An Iowa Pollination Celebration 2016, to raise money for the Decorah Community Prairie and Butterfly Garden. The Prairie is located right near downtown, and is an excellent illustration of the difference communities can make in the effort to save pollinators. It is literally abuzz in every direction, and has a devoted volunteer base. The Decorah Department of Parks and Rec is having the calendar printed, and it will be in local stores beginning October 2nd. The cost is $10, with $4.50 covering printing, $2.00 going to the retailer to cover credit card and other costs, and the remaining $3.50 going to the Prairie. If you're interested in having one, you can order it here: contact us. Can Bees Build Soybean Yields? ﻿The irony that so many of the fertilizers used upriver are manufactured in the region that is then negatively impacted by those same nutrients traveling back down the Mississippi was not lost on the people with whom we met on our recent trip to Louisiana. This particular point is illustrative of the complexity of the ties between Midwestern farmers and the people making their living in the waters of the South—and why we're hoping to establish a working relationship between Iowa farmers and Louisiana fisherman. We (Shannon and Robin) went down with a number of meetings set up to discuss Iowa’s role in the formation of—and, we are hopeful, alleviation of—the hypoxic zone with some of the region's leading ecologists. ﻿ There was an encouraging response to our initial request to meet with these prominent role players in Gulf Coast ecology to discuss the potential for a project bringing Iowa farmers and Louisiana fishermen together to explore all of the issues affecting each profession, and to work together to increase understanding of one another’s situation. In New Iberia, we met with Wilma Subra, President of Subra Company, an environmental consulting firm. Wilma told us about conditions in the Gulf of Mexico that threaten the health and livelihood of those living and working in it. Wilma was named a MacArthur Fellow in 1999 for her fearless commitment to protecting the people and restoring the environment of the Gulf and the bayous of Louisiana. Wilma’s work is sometimes interpreted by locals as a threat to their livelihoods, rather than an effort to protect their health and resources, and as a result, she has had to make her office windows bullet-proof, due to regularly having to replace shot-out ones. She expressed support for our plan to bring Iowa farmers and Louisiana fisherman together to address hypoxia in the Gulf, and offered to help in any way she can. She did, however, point out that the fishing community is facing high levels of depression and stress, as the effects of the BP spill have made fishing difficult, and the loss of barrier islands and wetlands is washing away the land on which their homes and businesses sit. She emphasized that any effort would have to be sensitive to these issues, and sincere in its intentions. ﻿ (2012), Dr. Nancy Rabalais (see the You-Tube video on our Hypoxic Zone page), welcomed us to her home, where she was recovering from recent knee surgery. Her husband, Dr. R. Eugene Turner, was also there. Nancy is an ecologist working to increase our understanding—and the mitigation—of hypoxic zones. She is professor and executive director for the Louisiana Universities Marine Consortium. Gene is a professor in the Louisiana State University Department of Oceanography and Coastal Sciences. Gene felt that working on a grassroots level to address nutrient flow to the Gulf is probably the most promising way to make positive change, as other means of addressing such issues are so often bogged down in political and financial issues. He and Nancy gave us some ideas ﻿and contacts, offering to provide ongoing guidance. In New Orleans, we met with Matt Rota, at the Gulf Restoration Network (healthygulf.org). Matt is the son of southern Illinois farmers, so fully understands all of the issues that surround nutrient use and loss. He provided some ideas and offered his support, as well. 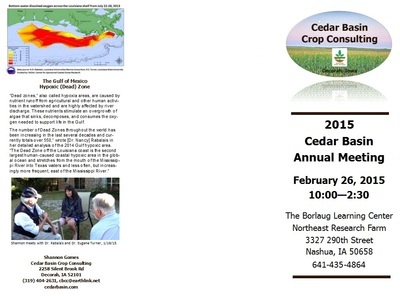 We ask you to give some thought to participating in ﻿Farmers and Fisherman: No Gulf between Us, ﻿a project Cedar Basin is developing to increase understanding on both ends of the Mississippi. The project will facilitate learning what's at stake for all involved, how we can work together to everyone's benefit, and what we can all do to alleviate the dead zone in the Gulf while continuing to provide a livelihood for our families and food for the world. Exchanges like this have happened in the past (see the YouTube video on our Hypoxic Zone page), but we are hoping to develop an engaging, ongoing "sister city" kind of link between Iowa farmers and Louisiana fishermen. Our intention is to have visits, including fishing in area waters, to the Gulf and the bayous (and to visit New Orleans, of course! ), as well as to Iowa farms. We hope to establish a friendly, empathetic, and lasting relationship to work toward building understanding between not just project participants, but between all parties whose professions affect the Mississippi and the Gulf. After all, the world has gotten too small to consider even one drop "your water" or "my water"; it's all "Our water" now--with the big O--so we'd better get busy keeping it safe for every living thing that depends upon it. We at Cedar Basin were very pleased to learn that the life-sustaining resource probably most overlooked in efforts to protect the planet is having its own year of celebration: the International Year of Soils 2015 (IYS 2015). For too long, we have simply not recognized the value of soils in not only producing food, but in protecting our water and air, and in its potential for having a tremendous positive impact on climate change. While the soil health movement has continued to grow, it is often easy to so focus on the economic benefits of healthy soils that we lose sight of the big picture of their value. One philosophy that has come out of the soil health movement is, You've been taking care of your above-ground livestock, now it's time to give equal attention to your below-ground livestock. Few things are more disheartening than to pick up a handful of some of the best soil in the world and find that it's been turned into merely an overly manipulated, sterile material for acceptable food production; it's no longer the earth-scented, rich, biologically diverse, teaming-with-life environment capable of generating even more life it is meant to be. All of those little microbes and critters in undisturbed land are there for a purpose, and if we just help them to do their thing in our fields, as well, we can see significant improvements in water quality and food production. Advocate for rapid capacity enhance-ment for soil information collection and monitoring at all levels (global, regional and national). Please join in the International Year of Soils 2015, and, given your relationship with the soils you farm, do your part in helping others to understand their true value. 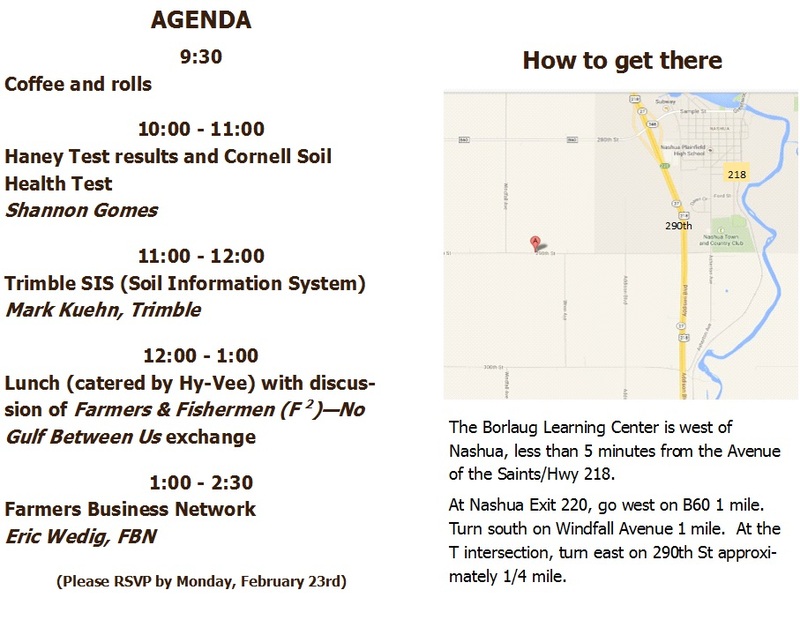 Hope to See You at the Annual Meeting, 26 February at the Borlaug Center, 9:30-3:00! By now, it should be evident Shannon has an obsession with learning every possible thing about your soil in order to advise you well and protect your most valuable resource. To that end, he's become a regional service provider for Trimble Agriculture's Soil Information System (SIS). Trimble Agriculture has a new agronomic service that is part of its Connected Farm™ solution. The new service, Soil Information System™ (SIS) solution, provides farmers and their trusted advisors with in-depth 3-D soil data they can use to make more informed decisions about their crop production goals. The SIS data is accessed through Connected Farm and can be used with Trimble's Farm Works™ farm management software or other geographic information systems (GIS) platforms. Connected Farm enables better decision making by providing one central location for accessing key information impacting farm operations such as rainfall totals, weather forecasts, commodity tracking, planting coverage, yield mapping, fleet manage-ment, and irrigation monitoring and control. unique challenges of each area of their fields. The SIS solution outputs precise, multi-layer soil models that are more comprehensive than traditional methods used in the industry today. Some examples of map types include: root zone depth, soil texture, plant available water, compaction depth, macro and micro-nutrient levels, soil nutrient holding capacity, and salt and toxicity concentrations. By analyzing soil variability and patterns prior to sampling—and by using its industry-exclusive data acquisition and analysis software—SIS provides targeted recommendations on the best locations where soil samples should be taken. In some cases this reduces the number of samples required to provide high-quality information by as much as 60 percent over traditional sampling methods. As a result, the solution enables agronomists and other trusted advisors to be more efficient with in-field data collection, providing valuable time and operating cost savings. "By adding the Soil Information System solution to Connected Farm, Trimble is providing farmers and their agronomists with critical soil information they can use to improve crop production and benefit the bottom line," said Levi Kettle, Connected Farm business area director of Trimble's Agriculture Division. "For example, knowing the soil's plant available water capacity can aid in irrigation layout, scheduling, moisture sensor targeting, root stock selection and many other management decisions." "Variability in yield and quality are due primarily to non-uniform soils being managed as uniform soils. In the past, our inability to identify the components of this soil variability prevented us from achieving greater crop uniformity and better economic returns," said Robert Wample, Ph.D., a plant physiologist and owner of Edgeknoll Consulting, an SIS service provider. "SIS allows us to take a proactive approach to overcoming soil variability, and when combined with geo-referenced variability in crop yield and quality, the effectiveness of this approach is enhanced even more resulting in an 'agricultural forensics' approach to precision agriculture." You can learn more about Trimble SIS at the CBCC annual meeting on February 26. 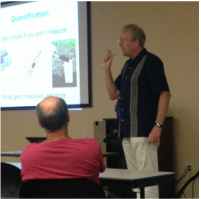 Dr. van Es updated the group on Adapt-N and discussed soil health. 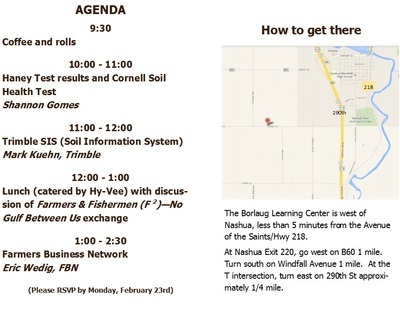 Cornell's Dr.Harold van Es spoke about soil health and Adapt-N, and Amol Deshpande and Charles Baron presented their vision of Farmers Business Network (FBN) to the participants of Cedar Basin's August 8th, 2014 day at the Borlaug Center in Nashua. Thirty people attended the event. Dr. Harold van Es, of Cornell University's College of Agriculture and Life Sciences, went through the Adapt-N program with updates on the state of the software. Dr. van Es is one of the masterminds behind the development of Adapt-N, which has since been sold to Agronomic Technology Corporation for commercial distribution. He also did a presentation to increase our understanding of soil health. Journalist Lynn Betts produced a 3-part video on Adapt-N with Dr. van Es following the meeting. The video consists of a number of basic questions about the software and how farmers and consultants can benefit from it. Watch for the video to be posted on cedarbasin.com and YouTube in the near future. The discussion continues in the parking lot. Charles Baron and Amol Deshpande are second and third from the left. Mr. Deshpande, CEO and Co-Founder of FBN), describes it as a farmer first company. "It was created as a platform to help farmers level the playing field with those around them by providing independent and unbiased information," he says. "FBN does this by using a combination of data science and engineering innovation to help capture, store, visualize and interpret complex data created at the farm. It is a fundamental mission of FBN to be ultra-low cost and not charge acreage fees, as the company goal is to add value back to the farmer in any way possible. Charles Baron, VP of Product at FBN, says, "FBN's product philosophy is centered on delivering radical value to farmers and their advisers through unprecedented analytics, seamless user experiences, and fiercely advocating the farmers' benefit amidst a confusing big data environment. FBN aims to bring farmers' data to life, simplifying integration, storage, and visualization while uncovering insights." FBN is still in development; however, you can request early access to their service, as well as see employment opportunities, at http://www.farmersbusinessnetwork.com/. You may have seen Robin at the Borlaug Learning Center, running around trying to keep things going smoothly during Cedar Basin meetings--and not doing too badly until a computer issue arose... Robin and Shannon married in August 2012, and she joined him at Cedar Basin in January of this year. Before coming to Cedar Basin, Robin worked for La Crosse County Human Services for a number of years. Prior to that, she had a long stint in the Ho-Chunk Nation Department of Education. She also has years of experience working in the environmental and other nonprofit sectors. She got her B.A. at the University of Minnesota, where she received approval for an individually-designed major in International Social Development, emphasizing the environmental impact of meeting basic human needs, particularly health needs. Robin has been interested in agriculture, soils in particular, for most of her life. "I went to high school in farm country and we had an extensive agriculture curriculum there. I took full advantage of that. I became particularly interested in riparian issues while working with the Nevada Indian Environmental Coalition. And when I graduated from college, I actually regretted not pursuing specialization in nitrogen-fixing trees." Robin's finding working at Cedar Basin very rewarding, and having her husband as her boss is actually not a bad thing--as long as his office is in the new outbuilding and hers is in the house... She is particularly excited about focusing on soil health. Since high school, Sean has been interested in and concerned with environmental issues. When he married into a farming family, he was able to see all that needed to happen in order to produce a successful and profitable crop. "I came to realize that information was the key to the sustainable use of our resources and the farmer's bottom line," Sean says. "I see working at Cedar Basin as an opportunity to use my skills to help farmers increase their profitability by reducing the amount of nutrients that are lost to the environment." Besides Cedar Basin Crop Consulting, Sean is also assisting with Shannon and Frank Moore's partnership, Soil Investigative Services, and Frank's Three Rivers Ag Consulting. Degrees in both Biology/Environmental Science and Science Education make Sean a great asset to the three organizations between which he shares his time. His professional qualifications include being a chemist with the Stearn's County Dairy Herd Improvement Association. His professional commitment to the environment is illustrated by his having been Iowa Conservation Teacher of the Year in 2010, and receiving the Iowa Governor's Award for Excellence in Environmental Education in 2009. Sean says the part of his new position that he's most excited about is earning Agronomist credentials over the next several months. He should be able to continue with Cedar Basin in that capacity sometime in 2015. He lives in West Union with his wife, April, and their two children, Sam, 10, and Josi, 5. The first day of the training consisted of visits to numerous New York farms. Here, farmer Klaas Martens explains to the group how soil health practices help his organic operation. 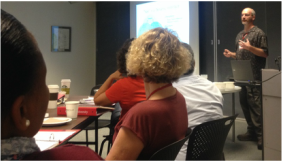 In August, Robin and 54 other particiants from around the world gathered at Cornell University in Ithaca, NY, to learn all that Cornell can teach--at least, all that it can teach in four intensive days of training--about soil health assessment and practices. The fact that participants came from as far away as South Africa, Finland, Colombia, Pakistan, and Guatemala illustrates how the comprehensive Cornell Soil Health Test (CSHT) and the University's commitment to soil health practices are gaining broad recognition internationally for their potential to regenerate and preserve the world's soils while feeding an ever-growing population. The training consisted of a day of field trips to farms utilizing the Cornell soil health model and research farms demonstrating the benefits of cover crops, long-term tillage studies, and development of soil health management equipment. The second day had attendees in hands-on lab sessions learning about infiltration, cover crop choices, soil organisms, and penetrometer use, as well as in the classroom learning soil physical, chemical, and biological processes. Time was also devoted to learning the dos and don'ts of soil health management and the science behind the CSHT. 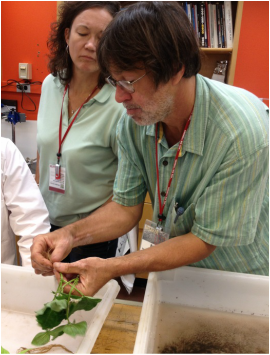 Cornell's Dan Moebius-Clune enthusiastically shared his knowledge of soil proteins with the group. Cornell's Bob Schindelbeck explains what's being looked for in the root pathogen pressure bioassay portion of the Cornell test. Day three had participants back in class learning to interpret the results of the CSHT. There was a breakout-group session where each group was given a different scenario including a farm type and a description of the farmer's attitude toward trying new practices, along with the results of a soil health test. The groups had to produce a plan for working with their farmer to implement changes that would best serve the soil and the farm. On the fourth day, participants went from lab to lab learning each step of the CSHT. The test takes up to six weeks to complete, including the root pathogen pressure bioassay, which requires the cultivation of test plants in the soil sample. Participants in the conference were anxious to take the CSHT back to their countries and organizations and agencies. There were numerous comments about how other soil tests, while often beneficial, just do not give the farmer the same kind of detailed assessment of his/her soils. Robin returned from Ithaca feeling more confident in her knowledge of soil health and anxious to continue working with Cedar Basin farmers and Cornell to preserve one of the world's most precious and endangered resources. A Soil and Climate Change Connection? Oh, yeah! While the dismaying controversy about climate change continues here in the U.S., it is not a new or even controversial fact that scientists and others have long been espousing the need for maintaining healthy soils in order to feed the world. Images from the Dust Bowl illustrate just how disastrous taking our soils for granted can be. Recent research shows that healthy soils can also play a significant role in mitigating climate change, so implementing practices to save one of our most precious resources appears to be a win-win move, regardless of politics or ideologies. As the pressure on the world's water resources increases, there is indisputable evidence that healthy soils can also protect our drinking water, fisheries, wildlife, and recreational areas. We can no longer separate local water from world water--just witness the concern over Fukushima's water reaching the U.S. west coast, or the effect farming in the Midwest is having on the Gulf of Mexico. It is imperative that the world start treating this other most precious of resources as one body of water immune to the usual influences of boundaries, and building and maintaining healthy soils will play a significant role in achieving reliable, safe water sources around the world. Looking at soils within the framework of soil health is a fascinating and exciting viewpoint. When you understand the soil as a complex ecosystem with a multitude of living organisms--microbes, fungi, bacteria, and insects--that are all critical players in the health of that ecosystem, you can't help but marvel at the beauty of how it all works together. 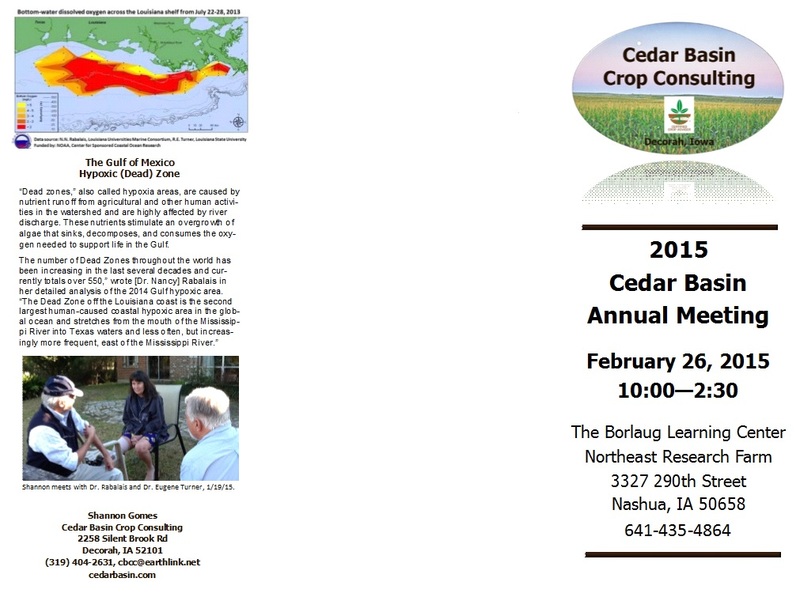 Cedar Basin Crop Consulting has been participating in and advocating for the soil health movement since the early stages of its shift to the forefront of sustainable agriculture. We have been exploring the technologies, some as old as agriculture itself and some as contemporary as the latest smartphone app, to develop what we believe will be a holistic approach to bringing our soils back to the rich resource they once were, and maintaining them at a level that will help us keep up with food demand while protecting our air and water. If the Soil Health section of this website inspires you to get more involved in the move toward a comprehensive understanding of your soils, or if you want to begin applying the principles to your land, please contact us through the Contact Us tab. The care of our soils will impact our children's future enormously. As one farmer recently said, "I don't ever want my grandchild to come to me and say, 'Grandpa, if you knew you could do this to save the soil, why didn't you?'." 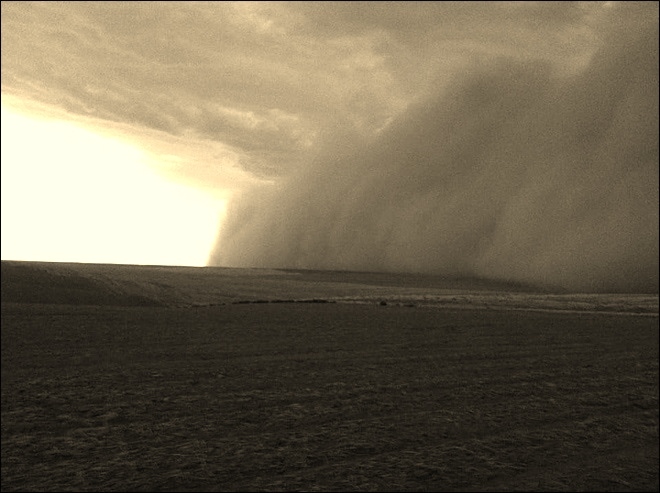 Dust Bowl of the 30s? No! 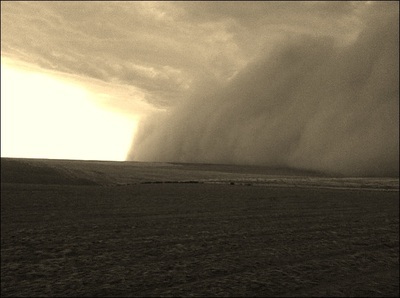 These are pictures of Colorado, Texas, and Washington dust storms in 2013. You know that it’s your crop that’s hitting the windows and blowing away, and it’s not just affecting you, but also everyone else. You can’t stand to look at it. It’s like a train wreck, looking a disaster full in the face. 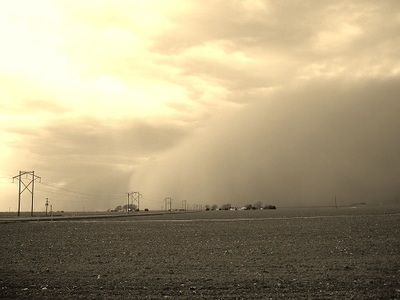 Ken Burns's PBS documentary, The Dust Bowl, is compelling and timely television. See Burns discuss the Dust Bowl at the YouTube link below. The New York Times Room for Debate offers a discussion on preventing another dust bowl with various perspectives. Click the link below. Change: Improving Soil Carbon and Nitrogen Management Through the Use of Soil Health Testing and the Adapt-N Management Tool. The project consists of 20 participating farmers providing crop strips which will allow a comparison between crop yields and soil health for both the farmers' traditional planting methods and those promoted by soil health advocates. Testing will utilize the Haney Test, the Solvita Carbon Burst Test, the NRCS Soil Health Test, Cornell University's infiltrometer for measurement of rain infiltration, and Adapt-N. We also expect to utilize cover crops on some of the test plots. Test results during and after the 2014 and 2015 seasons are anticipated to show measurable improvement in soil health, and both the financial and environmental benefits of precision nitrogen application. It is our belief that when farmers employ practices such as low- or no-tilling, precision inputs, and cover cropping, they will see improvements in soil health, crop yields, and lower costs. We'll keep you updated as the project progresses.